Healthy baking is a very rewarding way to spend some time – not only do you get to create something tasty for the family, but you know exactly what has gone into it, so there’s no hidden calories or additives. Although ‘healthy baking’ may sound like an oxymoron, there are actually plenty of ways to cut calories while still baking delicious treats. It can take a bit of trial and error, but in many recipes you can swap at least half of the sugar for pureed fruit or use less fat than the recipe states. Adding in vanilla extract is also a good way to boost the flavour without adding calories and a little Demerara sugar can be used in place of a greater quantity of castor sugar with similar results. 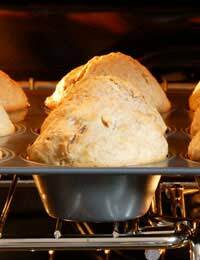 As a rule of thumb, muffins, flapjacks and dough-based recipes are far more resilient to cutting calories and swapping ingredients than lighter Victoria sponges and cakes, where the ingredients have to be carefully calibrated so they rise. Here are three basic recipes with ideas for baking your favourite healthy treats. Heat the oven to 180ºC and line 10 muffin cases. Simply mix the dry ingredients together in one large bowl and combine the wet ingredients in a jug. Add the wet ingredients to the dry and quickly mix – you don’t want a smooth batter as it’s the lumps that help the muffins to rise. Just stir a few times and fill the muffin cases to about two thirds. Bake for 12 – 15 minutes and leave to cool. You can top these with a little cream cheese but you’ll be adding extra calories! Heat the oven to 180ºC. Dissolve the honey in the water and add the yeast. Allow it to sit for ten minutes till it goes a bit frothy. In a large bowl, add the flour and stir in the salt and healthy stuff. Make a well in the middle and add the olive oil and the water mixture. Give it all a good mix and knead it for about ten minutes, then leave it to rest in a warm place (the airing cupboard is ideal!) Knead it again for five minutes and then make into a dozen rolls (you can make a loaf or pizza bases too). Put on a baking sheet that’s dusted with flour and brush with a little milk or olive oil (you can also sprinkle some sea salt on top) then bake for 20 minutes. Delicious with home made soup for lunch! Heat the oven to 180ºC. Simply mix all the ingredients together and squash into a well-greased baking tin that’s not too big (no more than 8x8 or it will be too crispy instead of lovely and chewy). Bake for 40 minutes and allow to cool in the tin (mark out into squares after a couple of minutes). You can experiment with adding chopped nuts and different spices – pecans and cinnamon are a great combination.